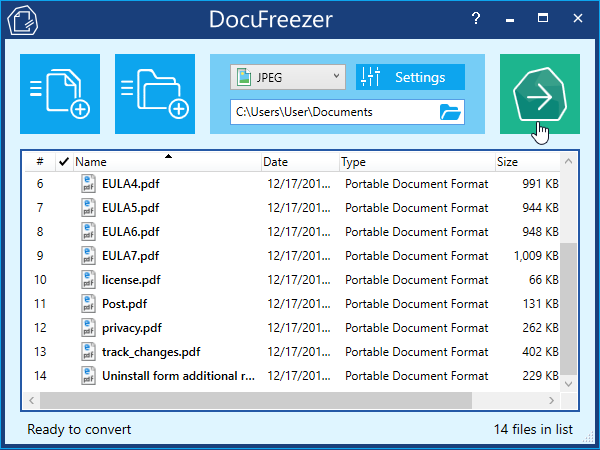 DocuFreezer / How To / How to Convert PDF to JPG for Free? Although the PDF format definitely has a lot of advantages, working with it is not so easy. To open PDF files you usually need additional resources; to insert a PDF file into another document or presentation may be problematic; and overall, this format requires some extra skills to deal with. The most vivid solution here would be converting PDF to JPEG thus making it easy to handle and share with others. Click Start to begin conversion of your PDF files to JPG. Free online services available nowadays will help you convert everything: documents, images, sound and even steal YouTube videos. At first sight they seem to be very efficient – you don’t need to install any software onto your computer, but in reality, you will have to deal with a lot of advertising banners with questionable contents; plus, the number of files that can be converted online is limited. DocuFreezer will not show you any banners. And you can convert any number of documents in one session. Virtual printing technology provides very popular solutions nowadays for converting documents. Virtual printer installed on your computer will convert the files you would like to print to PDF, JPG and other formats. Unfortunately, you can print only one document in one printing session. Or you will have to install additional software to automate the process of printing. DocuFreezer can convert any number of documents in one session. Plus, there will no additional printers added to your system. It means that if your wife needs to print documents from your laptop, she won’t be confused.